It was pretty funny to put this on Linc. He's just such a boy's boy. So to see him in pink..... it was just out of place! It was funny because he had it on and was laughing at himself saying, "I'm funny!" 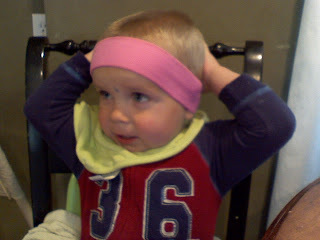 And then he took it off and tried to put it on my head. I guess he knows where it belongs. ah! i am so sad you guys are leaving!! what the heck!?! we'll have to come see you in az. we're actually down there quite a bit.